At Natural Green, we pride ourselves on providing our customers with honest and superior service. In all honesty, there isn’t currently a natural and organic product that will effectively kill weeds. However, a well-maintained and healthy landscape is extremely important when it comes to fighting off the threat of a weed takeover. Part of our weed control service involves promoting the natural strength of your landscape so that it becomes strong enough to grow and outperform weeds. Yet, we are well aware that there are cases that merit treatment. After extensively researching environmentally safe weed control products and methods, we have developed products and treatment methods that effectively target weeds while minimizing any harm to humans, animals and other plants. The key to our non-evasive and safe weed control practice is that we use selective herbicides that disable weed growth while not affecting other plants around your lawn. To add to that, each one of our knowledgeable technicians is trained to look for any threat of weeds during routine maintenance visits. By keeping a constant eye on weeds and any potential growth areas, we are able to effectively minimize their spread and threat. 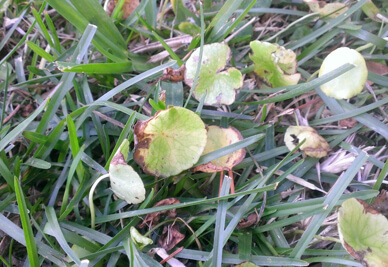 One of the most common weeds found in lawns around the state of Florida is the Dollarweed. These weeds, also known as Pennyworts, grow to the size of a silver dollar and can quickly spread throughout your lawn if not treated. When treating weeds, it’s important to understand how and where they grow. By creating an environment that keeps weeds at bay, we are able control where and how they grow in your lawn. In most cases, a simple change in cultural practices like watering and cutting can prevent the growth and spread of weeds. Proper fertilization practices are also a key component in preventing the spread of weeds. Many of the fertilizers and lawn feeds on the market promote the growth of both the lawn and weeds. The problem with these products is that it causes the weeds to become as strong as or stronger than the plants that beautify your landscape. 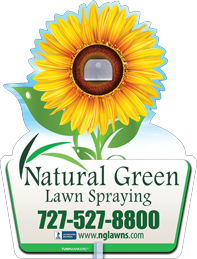 Natural Green products and services are created to keep your lawn healthy, strong, and beautiful, while minimizing and eradicating the various threats that include weed overgrowth. For a free analysis and more information about our weed control service, click on the link below to schedule an appointment with one of our knowledgeable and friendly technicians. Or you can view more information about our monthly plans.